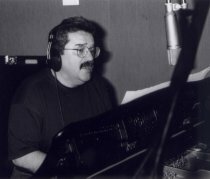 The year 2008 marks the 16th anniversary of the death of NICK De CARO, the gifted and respected arranger, producer, musician, songwriter and recording artist. His body of work includes many top-selling albums from the '70s and '80s, while it is his own solo recordings upon which his reputation rests in Japan, where he was enormously popular as a performer. For me, though, it is his earlier work that holds the strongest attraction. 'Home Of The Brave' by Bonnie & the Treasures on Phil Spector's Phi-Dan label, which Nick arranged, is a particular favourite. Then there's 'The Thrill Is Gone', one of the four wonderful titles he arranged for Clydie King, and the tremendous records he produced on Irma Thomas, from his time as staff producer at Liberty/Imperial. 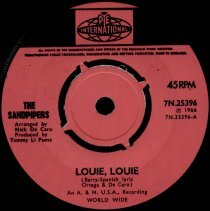 With Jackie DeShannon he co-wrote 'Is There Anything I Can Do', a folk-rock opus recorded by the Ashes, and who else but he could have transformed a garage rock nugget into the wall of clouds epic that was the Sandpipers' revamp of 'Louie, Louie'? All these records are proof that Nick De Caro was one of the greatest at his craft. I first remember meeting Nick De Caro, along with his brother Frank, when I was about 18. Nick was a few years younger than me, so he was probably 15 or 16. If I'm not mistaken, I think Frank called me and asked if I would be interested in doing some gigs with them. 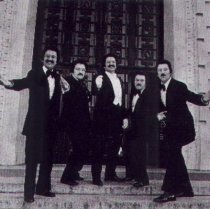 At the time, I had been part of a band that had been somewhat renowned in the Cleveland area, the Sammy Dee Quintet. Since the band had broken up, I imagine they thought I would be available. 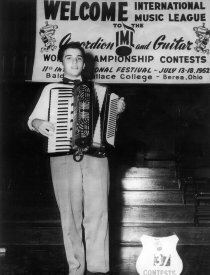 I recall being very impressed with Nick's agility at the accordion and found him very pleasing to play with, which I couldn't say for most accordion players I had worked with. We worked together regularly for the next seven years, one year of which was spent travelling to every toilet nightclub in the country. Somewhere around the age of 24, I was lucky enough to find a job as a promotion man at a record distributor in Cleveland. At about the same time, Nick either enlisted or was drafted into the Army. By early 1964 Nick had been discharged and I had moved to LA to work for Liberty Records, first as a promotion man and then as a song-plugger for their publishing company. Nick and I contacted one another and I told him that I felt there were many opportunities in LA and he should come out and stay with me until he found a place of his own. At first I gave him work making out lead sheets for new songs that were being written by staff writers, such as Jackie DeShannon and Randy Newman. After several months, I recommended Nick to Snuff Garrett, who was a star record producer with acts such as Bobby Vee and Gene McDaniels. Snuff was working on an instrumental album called 'The Roy Orbison Songbook' and had Nick do the arrangements. Of course, he did a fabulous job. After that project I recommended him to produce a single with Mel Carter, which became Nick's first national hit record, 'Hold Me, Thrill Me, Kiss Me'. By this time, two friends of mine, Jerry Moss and Herb Alpert, had started a record company called A&M and they asked me to be their first A&R staff producer. This is where I produced records such as the Sandpipers' 'Guantanamera' and albums for Claudine Longet and Chris Montez. Nick arranged those for me and worked on most of the records I did at A&M, including his very own first album, 'Happy Heart'. Andy Williams was married to Claudine Longet at the time and loved what Nick was doing, so hired him to produce several records for him, one of which was 'God Only Knows', which was an absolutely beautiful arrangement of that cover. I was very close friends with Randy Newman and Lenny Waronker. As Lenny's father Sy was Chairman of Liberty Records and Randy was a staff writer for the publishing company, we became fast friends. When Lenny joined Warner Bros. in 1966, he immediately brought Nick in to arrange strings for Gordon Lightfoot's classic hit 'If You Could Read My Mind'. Nick continued to arrange for several artists including James Taylor, Arlo Guthrie, Fleetwood Mac and Maria Muldaur's 'Midnight At The Oasis'. 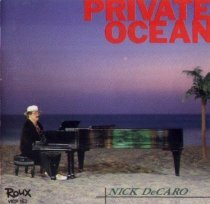 Later, when I became a partner in Blue Thumb Records, we released Nick De Caro's solo album that he and I co-produced and which exhibited his exceptional talent. Titled 'Italian Graffiti', it became a cult classic in Japan and made him a star there. The world has lost a very brilliant record maker and music man and I have lost a close friend. I miss him! To celebrate what would have been Nick De Caro's 70th birthday on June 23rd, Spectropop is honoured to present this heartfelt tribute, written by his sister-in-law Denise. The article begins with and features throughout reminiscences by Nick's brother Frank. "My brother decided to perform on this radio show called Burt's Amateur Hour when he was five. He sang 'Besame Mucho'. The audience went crazy. I still have the recording. Nick soon started writing little parts for our accordion/guitar duo and Dad became our manager and booker. Nick was born with perfect pitch, so nothing got by him. He was a perfectionist. Even then, he could be tough during those rehearsals, man. "One day Dad had me and Nick go to where he worked. Fisher Body was an old, dilapidated kind of place. He made it very clear to us that he didn't want us to end up there like him. Not to knock it, because Dad was proud of what he did, but he wanted us to know we had a choice. My Dad loved music. 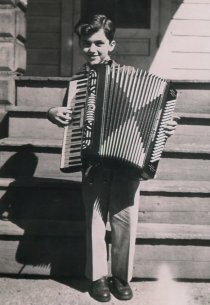 He saw music potential in my brother and bought him an accordion - top of the line, which even in the '40s cost a thousand dollars. Eventually, I began taking guitar lessons. "We toured with the USO as young teenagers and got in on the tail end of real live radio with our own show. We could dedicate songs to our friends and they loved it. We became popular at the school dances and performed frequently at local talent shows and won. Music gave us a chance to establish our identity doing something we loved. Nick got to experiment with his writing. This was at a great station out of our hometown, Cleveland, WJW. "After we'd finish our show the PD would say, 'Take it away' to the next show, and on the other side of the glass was none other than Alan Freed. Freed would take off his jacket, loosen his tie and we heard this great music, rhythm & blues. And right there before our eyes he said: 'Rock & roll.' Within a week other DJs in town were using the term." The phrase rock & roll was now becoming as popular as Alan Freed, the man who invented the new beat. 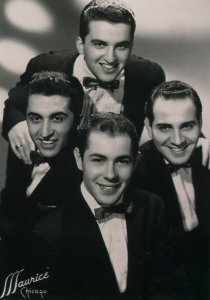 In the late 1950s the De Caro brothers duo expanded with Bill Krempasky on bass and future record producer Tommy LiPuma on saxophone to complete the group, the Mello D's. Frank remembers how "Tommy always had a very good ear, and was great with both the social and creative aspects of the music business, so it's no wonder that he is one of today's most successful producers." 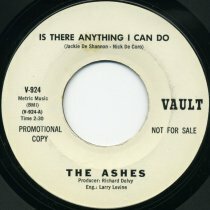 LiPuma's association with the De Caros developed into one of the most successful recording collaborations, which included twenty-time Grammy-winning engineer Al Schmitt. Eventually, the Mello D's came off the road and took very different paths. 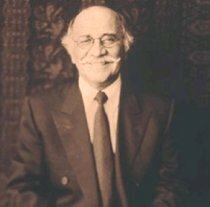 LiPuma decided to pursue the record business ground level and soon moved up to promoting records in Cleveland and New York. Nick had completed his music training at the Cleveland Music Institute and joined the military at the same time as brother Frank. Not long out of the service, one wintry day in 1964 Nick and Frank received a call from Tommy LiPuma. At the time, Tommy was in Hollywood working for the Los Angeles label Liberty. "Guess what?" he said. "I'm eating ice cream and it's melting on my bathing suit." LiPuma encouraged the brothers to come out to the West Coast and check it out. "It took us a couple of days, but Nick and I were out of Cleveland. We had a couple of bucks, Nick's accordion and a broken down Pontiac that looked like it could still get us there. We threw it all in the trunk and with my Dad's blessing we were off in the dead of winter. Route 66 all the way, man. We chugged into LA and it was sunny." 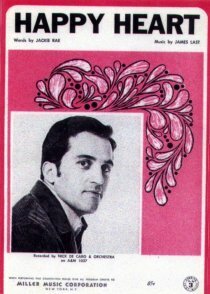 Nick De Caro's first big hit as producer and arranger was 'Hold Me, Thrill Me, Kiss Me' by Mel Carter on Imperial in 1965. Frank was the featured guitar player on the hit. "Bob Skaff, A&R Director at Liberty, brought the tune to Nick for him to produce. It flew right up there on the charts. Mel Carter performed it live recently on TV along with Nick's great arrangement. It was also featured in the Mel Gibson movie When We Were Soldiers. It sounded great. Actually, several of Nick's recordings are featured in major movies today. It's amazing." Nick also arranged and produced Mel Carter's 'My Heart Sings' album. lots of horns, strings. Very fancy stuff, very good." He suggested to the decision-makers at Liberty/Imperial that Nick should do his own record. (Later Nick would arrange 'Rollin'' and 'Marie' on Newman's 'Good Old Boys' LP.) "We were a block away from Sunset Boulevard, so Randy came up with the name. So the 'Sunset Strings Play The Roy Orbison Songbook' was recorded. Man, what a record! It was Nick's first foothold. He blew away everybody there." Nick also wrote, produced and arranged 'Think It Over Baby' and 'I'm Gonna Make It' by the O'Jays. 1965 was a good year. In 1967, the De Caro brothers became a major part of the catalogue of A&M, the label founded by Jerry Moss and Herb Alpert. Along with the Tijuana Brass, Chris Montez, Claudine Longet, the Sandpipers, the Baja Marimba Band (of which Frank was a member) and the Carpenters, the De Caros soon achieved success in the AOR era of the '70s. From 1967-1970, Nick, "The Hit Maker", produced and/or arranged six albums for Claudine Longet, four for Chris Montez and six for the Sandpipers. He also produced and arranged 'Love Story', 'Honey' and 'Born Free' for Andy Williams. At Warner/Reprise, Nick came together again with Randy Newman, Tommy LiPuma, Lenny Waronker and Joe Wissert on the making of recordings by the group Harpers Bizarre, five middleclass kids from Northern California, including Ted Templeman. Produced by Waronker, Nick arranged several tracks with Newman writing some of the material. "The first release 'Feelin' Groovy' was a smash hit. I was on the road with the Baja and really didn't know too much about it, but it turned out great for Ted Templeman, who became a major producer over at Warner Brothers with the Doobies and so many more." 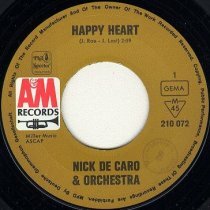 In 1969, Herb Alpert gave Nick a shot at making his own LP, 'Happy Heart with Nick De Caro and Orchestra', produced by Nick and Tommy LiPuma. Highlights included 'I'm Gonna Make You Love Me', Brian Wilson's 'Caroline No', 'Hey Jude' and Nick's own song 'Love Is All'. With Nick as producer, arranger, songwriter, musician and vocalist there was much anticipation, especially as the title track began to climb the charts. At that time, Nick received a phone call from Andy Williams, who had acquired the rights to do 'Happy Heart' with a lyric. He wanted Nick to produce and arrange, but Nick declined and the rest is history. "Nick was really crushed," recalls Frank. "He wanted no part of it, since his own record of 'Happy Heart' was just starting to get recognition on the charts. Nick felt he would've been competing with his own record. What really hurt him was that they used his arrangement on Andy's record. There was also some mention of a bet between Jerry Moss and Herb Alpert regarding the expected success of Nick's 'Happy Heart' LP. It pretty much took my brother a year to recover, since Andy's record was a smash hit. It was not a good time for him." Nick gave his solo career another try in 1974 with 'Italian Graffiti'. His musicians on the album included David T. Walker and Arthur Adams on guitar, Wilton Felder on bass, drummers Paul Humphrey and Harvey Mason, Plas Johnson on alto sax, Tony Ortega on tenor sax, Jim Hugart on upright bass and flautist Bud Shank. From the pop bossa tempo of Steven Bishop's 'Under The Jamaican Moon' to the obscure 'While The City Sleeps' by Randy Newman and one of Nick's favourites, 'All I Want' by Joni Mitchell, on which he alters the lyric "I want to knit you a sweater" to "I want to lift your sweater", and a surprise ballad arrangement on 'Tea For Two', which includes the verse, it's all Nick De Caro - lush string arrangements, great upbeat pop with a Jersey edge wrapped in Nick's vocal harmonies and sometimes haunting solos. Unfortunately, the Blue Thumb label began to have serious financial problems. Nick discovered the depth of the problem during a promo trip to his hometown, Cleveland. "Nick appeared on a live radio interview with several tracks from the album being played. It all sounded good, real positive, except for one thing. At the 'Italian Graffiti' promo party, the label was unable to pay for the event and approached Nick to cover the total cost. My brother couldn't believe it." Soon after the incident, the financial backers (Gulf Western) called a meeting and took control of the label. "For Nick, this was the straw as they say. This record had all the elements of success, the tunes, the players and Nick, but with no promo money, it didn't have a chance. I don't think it even got a single review. The label failed to live up to its commitment." Nick continued to move on to the next to last phase of his amazing career as prominent arranger and or producer to Grammy-winning artists. To mention but a few LPs: James Taylor's 'Gorilla' and 'In The Pocket', Gordon Lightfoot's 'If You Could Read My Mind', 'Don Quixote' and 'Sundown', Little Feet's 'Time Loves A Hero', Neil Diamond's 'Beautiful Noise', George Benson's 'Weekend In LA', Maria Muldaur's 'Maria Muldaur', Helen Reddy's 'I Don't Know How To Love Him', 'No Way To Treat A Lady', 'Music Music' and 'Imagination', Dolly Parton's 'Here You Come Again', 'I Will Always Love You' and 'Heartbreaker', Barbra Streisand's 'The Way We Were', 'Barbra Joan', 'Songbird', 'Wet' and 'Superman', the Baja Marimba Band's 'Fresh Air' and Rickie Lee Jones' 'Rickie Lee Jones', 'Pirates', 'Girl At Her Volcano' and 'The Magazine'. Many projects were also recorded with brother Frank as music contractor and A&R director of Charles Koppelman and Gary Klein's The Entertainment Company. One of the most notable recordings of the '70s was Dolly Parton's 'Here You Come Again' with Nick as arranger and vocalist. This album is still considered to be one of her best ever. Also, the Livingston Taylor album 'Three Way Mirror' exemplifies Nick's overall capacity to simultaneously produce, arrange, play accordion and provide vocals. 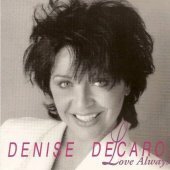 Whether the recording is James Taylor's 'Shower The People', Barbra Streisand's 'The Way We Were', Helen Reddy's career breaking record 'I Don't Know How To Love Him' or the Gordon Lightfoot hit 'If You Could Read My Mind', it is all "pure" Nick De Caro. "And with Nick it was all about the music." Throughout the '70s and '80s he appeared on at least 50 recordings playing the accordion and or concertina for everyone from Prince to Arlo Guthrie, the Stones to Randy Newman, Neil Diamond to Carly Simon, Dolly Parton to Johnny Cash, Livingston Taylor to James Taylor, Maria Muldaur to Glen Frey and many more. "Then one day in the late '80s Nick told me he wanted to go back to being a recording artist, which totally flabbergasted me at the time. I had been trying to get him to do this for 15 years. Furthermore, he told me, in essence, Japan came to him. They came to Hollywood. They wanted to do 'Italian Graffiti 2'. He was very excited, very upbeat in his own quiet way. He asked me to assist in the negotiations and he seemed pleased with the results. Also, Nick learned that something like 10,000 copies of 'Italian Graffiti' had been sold in Japan." The album recorded was 1991's 'Love Storm', which is a collection of songs, written mostly by Japanese star Tatsuro Yamashita and Alan O'Day, along with two originals written by Nick., 'Silent Night, Lonely Night' and 'Love Magic'. Although this album was not a collaboration, songs were suggested by Yamashita, who was a huge fan and had been following Nick's career since the '60s and the 'Hold Me, Thrill Me' hit. Tatsuro had the chance to finally meet Nick in 1990, around the time Nick recorded 'Love Storm'. It must have been a dream come true for the Japanese artist to finally meet his American music idol, whose first solo album since 'Italian Graffiti' includes several of his songs. Tatsuro was aware of Nick's work with A&M Records, and albums by Ben Sidran and Rickie Lee Jones. 'Italian Graffiti' for Tats though is "The end all. In major cities such as Tokyo and Osaka, import album stores began to spring up and through the stores 'Italian Graffiti' became a hit record. Even today, it has a cult like status." Nick De Caro followed up with a promo tour in Japan sponsored by Kirin Beer. 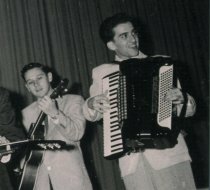 The Nick De Caro All Star Band consisted of LA's top studio musicians, including Neil Larson, David T. Walker and the Yellow Jackets' Jimmy Haslip on bass. Other acts on the bill included James Ingram and Ramsey Lewis. In his first solo performance Nick was in the spotlight, front and center at the grand piano, lush string arrangements, pure Nick vocals and his All Star Band in the opening song 'Love Storm'. The video reflects the pure delight and admiration on the faces of the entire orchestra. "My brother must have been terrified or extremely courageous. Probably both." Nick also performed and recorded with singer Agawa Yasuko. He conducted and arranged for her live concert recording 'Live At Orchard Hall', which received rave reviews. During this busy time, Nick was bouncing back and forth between the US and Japan. He recorded 'Bolero California' with Katoh Kazuhiko in the US and recorded with Tori Amos, whose 'Little Earthquakes' required Nick's guidance with a 40 piece orchestra. The piano and vocal tracks were laid down first. Everything else was built around them with layers of orchestral sweetening. The result was a hit album which featured Nick's stunning arrangements on both 'Mother' and 'Winter'. This would be his last work in the capacity of arranger for any artist other than himself. On Nick's second Japanese album, 'Private Ocean', engineered by Al Schmitt, he insisted on complete creative control. Frank recalls, "Nick was adamant about picking the tunes for this album. I remember at the meeting how he made it very clear that he wanted to record his own songs." 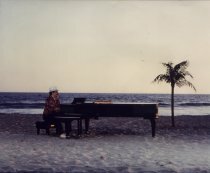 As a result, Nick recorded several of his own songs, including one he had intended for Frank Sinatra, 'Reach Out, I Won't Be There'. The personnel on the last two solo albums read like a who's who of LA's studio session players. They were David T Walker, Alex Acuna, Michael Landau, Jimmy Haslip, Neil Larson, Harvey Mason, Dean Parks, Eric Marienthal, Abe Laboriel, John Robinson, Tommy Morgan and Sid Page. 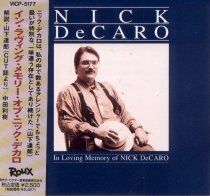 The final solo recording, produced by Nick and Tetsu Hoshika, embodies the true essence of songwriter, musician, vocalist, producer and arranger extraordinaire Nick De Caro. And so from the shadows of the recording studio the somewhat introspective producer stepped into the spotlight once again to pursue his solo career. Nick toured Japan twice, did TV and performed, arranged and produced several Japanese artists and projects. During the last two years of his life he was embraced by an audience who had applauded his work for decades. 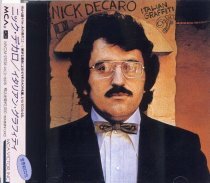 Although 'Italian Graffiti' was not well received in the USA, it clearly became a major force in establishing Nick De Caro as an international pop icon. Nick De Caro passed away on March 4th, 1992 at the age of 53. Funeral services were held at St Jude's Catholic Church in Westlake Village, California and in Cleveland, Ohio, where Nick is laid to rest with his father Nick Sr and mother Margaret, who passed away when Nick was 2 years old. He is survived by his brother Frank, sister-in-law Denise, nephew Nick and nieces Julianne and Francesca. 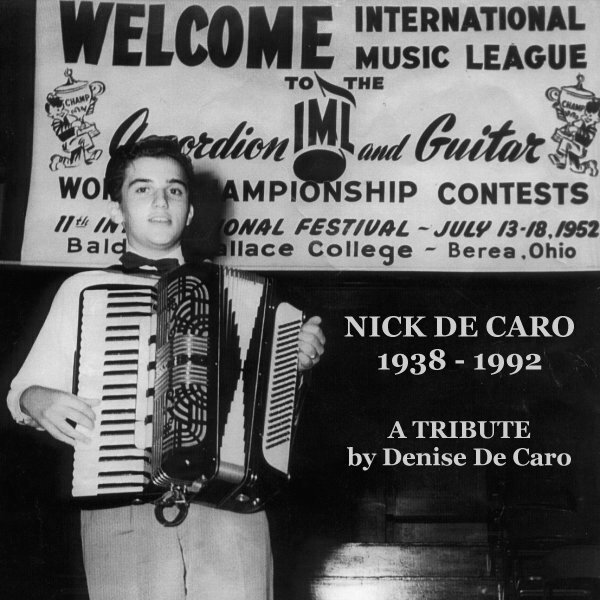 'Cause it's easy saying "Hello"
But it's hard saying "Goodbye"
C'est facile de dire "Hello"
Mais difficile de dire "Adieu"
The De Caro family wishes to thank family and music friends from all over the world who continue to celebrate the music genius of Nick De Caro. Gentle and kind music giant, you will never be forgotten. Your melodies and lyrics will live on in our lonely hearts forever. and 'Give Me A Sign', which Nick wrote for her. 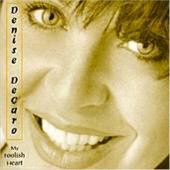 Denise's "De Caro Sings De Caro" project is currently in development. Yasuko Agawa, Alessi Brothers, Gregg Allmann, Tori Amos, Herb Alpert, Paul Anka, Ashes, Baja Marimba Band, Shirley Bassey, Marc Benno*, George Benson, Bonnie & the Treasures, Brewer & Shipley, Jorge Calderon, Glenn Campbell, Roberto Carlos, Vicki Carr, Mel Carter, Johnny Cash*, Cecilio & Kapono, Blondie Chaplin, Beth Nielson Chapman, Chunky, Novi & Ernie, Judy Collins, Ry Cooder, Rita Coolidge, Crackin', Randy Crawford, Credibility Gap, Patti Dahlstrom*, Dancer, Mac Davis, Denise DeCaro, Martin Denny, Jackie DeShannon, Neil Diamond, Michael Dinner*, Dion, Doobie Brothers, Lorraine Ellison, Everly Brothers, Fleetwood Mac, Glenn Frey, James Griffin, Flo & Eddie, Flower, Michael Franks, Jane Getz, Larry Groce*, Arlo Guthrie, Paul Hampton, Harpers Bizarre, Goldie Hawn, Murray Head, Heat, Levon Helm, Dan Hicks & His Hot Licks, Amy Holland, Engelbert Humperdinck, Paul Humphrey*, Tommy James, Tom Jans, Al Jarreau, Pete Jolly, Rickie Lee Jones, Kazuhiko Katoh, Michael Katakis, Barbara Keith, Clydie King, Kris Kristofferson*, Bill LaBounty, Cheryl Ladd*, Neil Larsen, Nicolette Larson, David Lasley, Albert Lee, Gary Lewis, Gordon Lightfoot, Little Feet, Claudine Longet, Donna Loren, Kate & Anna McGarrigle, Harvey Mandel, Larry Marks, Dave Mason, Steve Miller, Yoshitaka Minami, Liza Minnelli, Adam Mitchell, Mojo Men, Chris Montez, Montrose*, Peter Moon Band, Michael Martin Murphey, Maria Muhldaur, Navarro*, Randy Newman, Roger Nichols & a Small Circle of Friends, O'jays, Ami Ozaki, Ozark Mountain Daredevils*, Tom Pacheco*, Gaby Pahinui, Parade, Gene Parsons*, Dolly Parton, Paul Pena, Poco, P.J. Proby, Bonnie Raitt, Willis Alan Ramsey, Helen Reddy, Righteous Brothers, Jerry Riopelle*, Rolling Stones*, Ruby and the Romantics, Leon Russell, Samantha Sang, Sandpipers, Kathleen Saroyan, Harriet Schock, Seemon and Marijike*, Del Shannon, Bobby Sheen, Sheila E, Ben Sidran, Carly Simon*, Nancy Sinatra, Spirit, Phil Spector, Dusty Springfield, Starland Vocal Band, Starwood, B.W. Stevenson, Barbra Streisand, Sunset String, Gabor Szabo, James Taylor, Tommy Tedesco, Nino Tempo & April Stevens, Livingston Taylor, Danny Thomas, Irma Thomas, Allen Toussaint, Tanya Tucker*, Turtles, Phil Upchurch, Bobby Vee, Ventures, Wendy Waldman*, Jennifer Warnes, Jim Weatherly, Andy Williams, Robin Wilson. A complete Nick De Caro Discography would include at least 315 albums and/or sessions. More difficult to document would be his early work for Liberty and other labels during the mid-1960s.